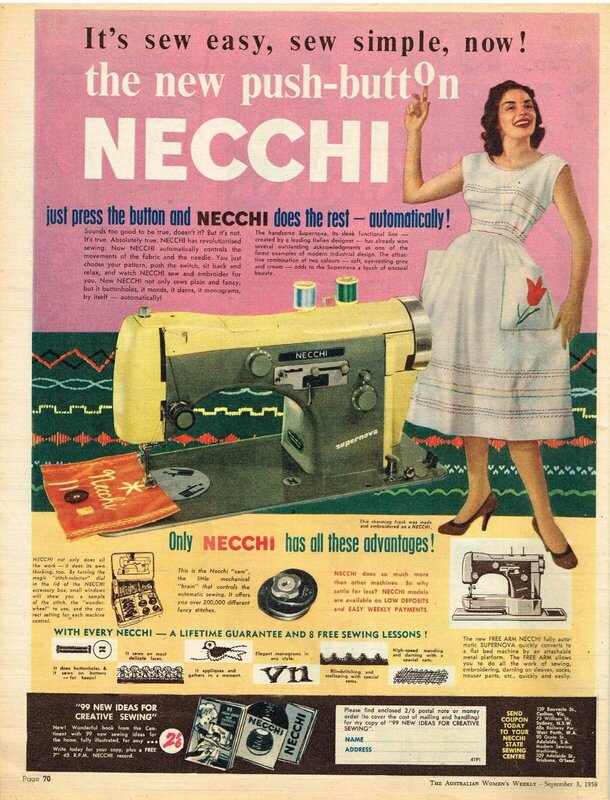 It says lifetime guarantee on that ad, I wonder if I can pop my Supernova to a local Necchi dealer for a free repair? The balance wheel clutch is still stuck. 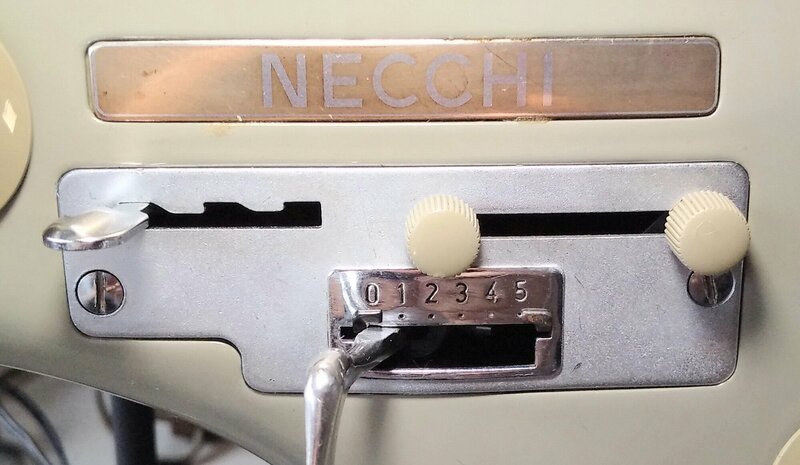 This is my Necchi Supernova Automatica C, Italy, 1955. This is the original first edition, as far as I can make out. It has complicated knobs and all steel gears. The motor was smoking and the exterior was in a bit of a state when it arrived. The interior was also in a bit of a state with rust in places. But the accessories box contained a full set of cams, and even some extras that the original owner had bought separately, plus a new buttonhole cam with lever bought in 1969 to replace the original chipped one, which is also present. A circular sewing attachment, a needle plate for a twin needle (set sideways! – they’ve gone forward in time by 60 years and copied my recent invention), a feed dog cover for embroidery (even though we can drop the feed dogs too), a manual and a project book, but no feet, which is ok except for the one special foot for the twin needle, but I was lucky enough to find it lurking in Helen Howes’ shop, where it is lurking no longer. So, here is my Supernova Automatica C – all cleaned up. 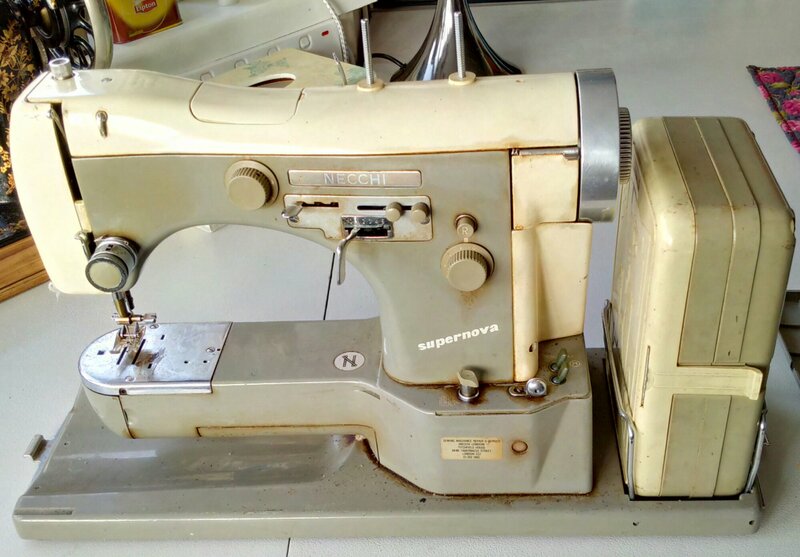 The machine was generally working as it came to me – the previous owner seems to have cared for it very well, up into late 1970s, but then… Owners don’t always age as gracefully as their machines, and this Supernova was spending increasingly much time in some dusty and humid environment – a garage, perhaps? So, there were some problems. Fortunately, nothing serious, just requiring tuning and adjustment. Firstly, she would not sew a straight stitch – it came out distinctly zig-zaggy! 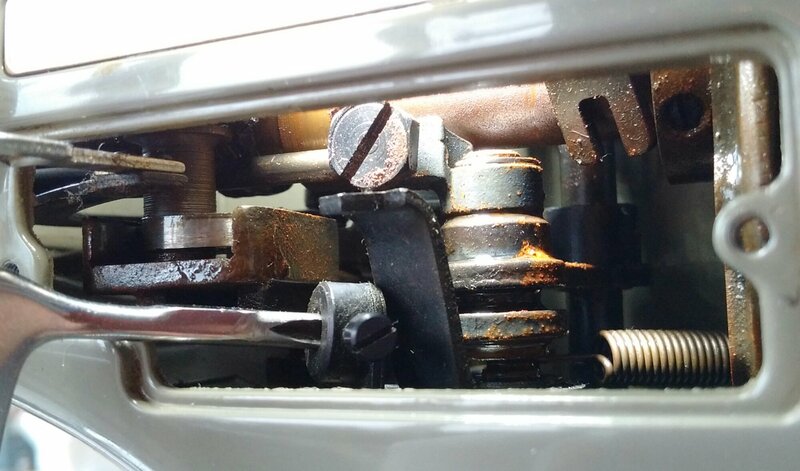 😮 Turns out, there was rust and gunk (but mostly loose rust particles) clogging up the zig-zag assembly, which is quite complex on this machine. I was lucky to find a service manual for a similar model (downloaded free from freenecchisewingmachinefiles.weebly.com), and although my zig-zag mechanism was even more complex than that, it was a very good start! The cam module clips onto the zig-zag module, so you can unscrew it and move out of the way. But beware: it’s double layer ball bearings as is revealed in the manual. You can’t get to the lower level ones without disassembling everything which I didn’t want to do. So I resorted to drenching the top layer with oil and hoping it would seep through to the lower layer all by itself. 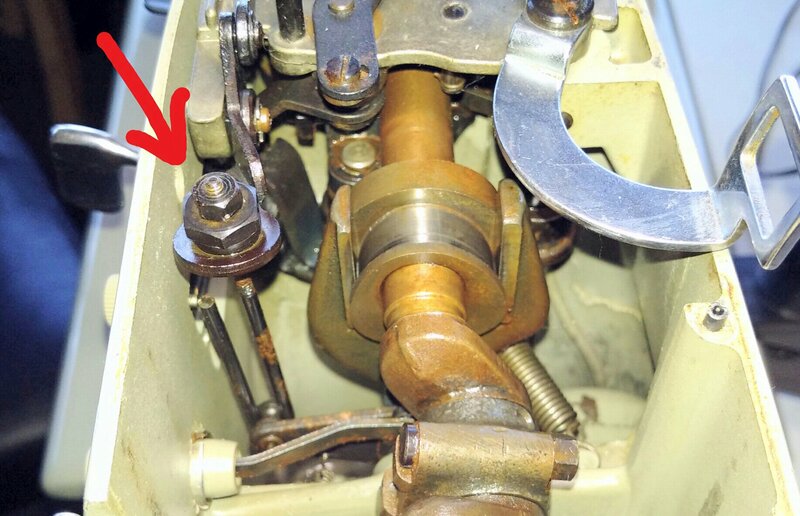 The little asymmetric screw cap in the above photo is a regulator of needle bar position. It rests against the little pole next to it. Set the needle position central and adjust it until the needle is exactly in the centre of the needle plate. But it still wouldn’t stitch straight. 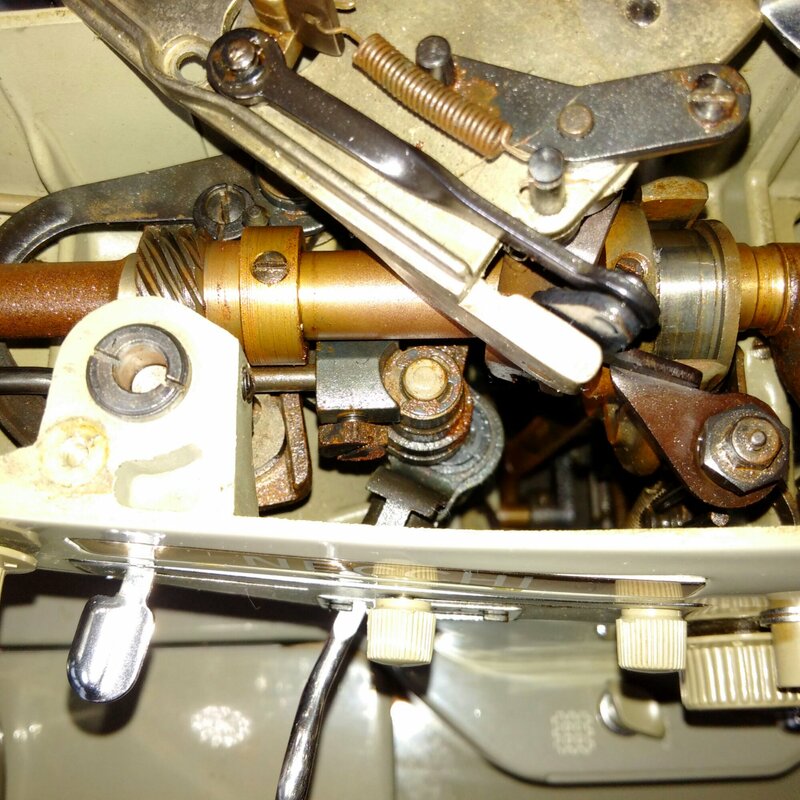 😦 Play around with the mechanism and observe that there is a sweet spot at a certain position of the zig-zag lever where indeed all lateral motion of the needle bar stops to get that elusive straight stitch. 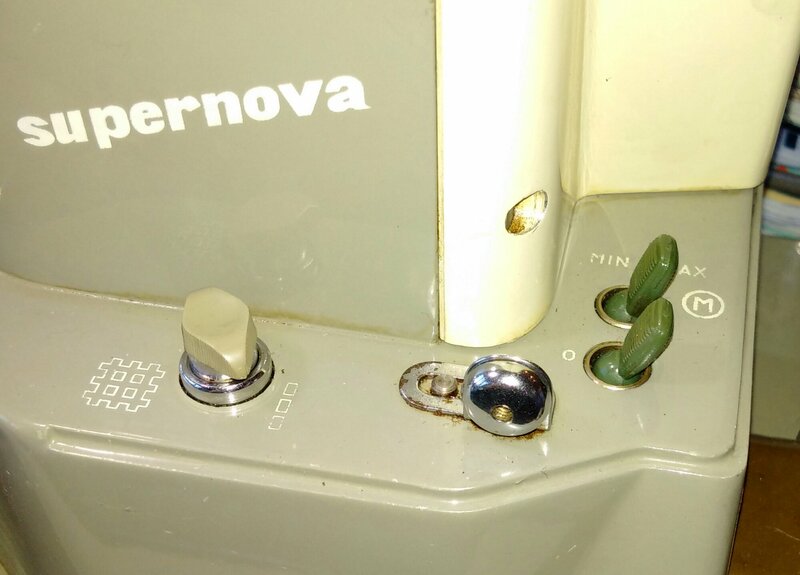 But that sweet spot is not in the left-most position of the lever! If you go too far left, you get zig-zag again. ​But I want to be able to move that knob, and don’t want to fish for the sweet spot every time I go back to straight stitch. I’ll need to install a block on the back of the plate to prevent going too far left. Putting everything back together and closing the lid, I realised that there is just one oiling hole in it – surely not enough for all those moving parts? But it’s enough if you’ve got a whole dispensing tray attached to it on the underside! 😀 I’ll make sure to keep that filled. Now then, the fancy stitches. The manual has some 150 examples, just to get you started 😉 so I tried a few. They came out very squashed, as if the machine wasn’t feeding properly. Back to plain straight stitch – definitely not feeding properly! The maximum setting gives a 2.5mm long stitch. 😦 It should be 4mm! Such problems are usually caused by the build-up of lint around the feed dogs, so let’s see! Remove the needle plate and simply lift the feed dogs out of the way! Wow! There’s a spring there, squashing up my finger. Nope, no lint. Or anyhow, not enough to cause any trouble. Which means that I’ll need to raise the feed dogs. The service manual says they should come up above the needle plate “to the full height of the dogs”. And what does the “full height” mean, exactly? Is it just the shaped bit or does the base count as well? 😐 I think it may depend on your machine. Anyhow, in my case they were just barely coming above the needle plate, so needed raising. Looking at the feed dog assembly from the side, it’s the left disk-bolt-nut contraption that regulates the height. But be careful – it’s fragile. I had to experiment with different height settings, testing them with straight stitch. Set too low, the machine doesn’t feed well and the maximum stitch length is too short. Set too high, the feed dogs bang into the needle plate – that’s obviously wrong. But then it can still be too high, even without banging – stitches get skipped, in particular at larger stitch lengths. Eventually I found a good setting which resulted in a 4mm maximum stitch length, exactly. Now, why didn’t I just measure those stitches before? 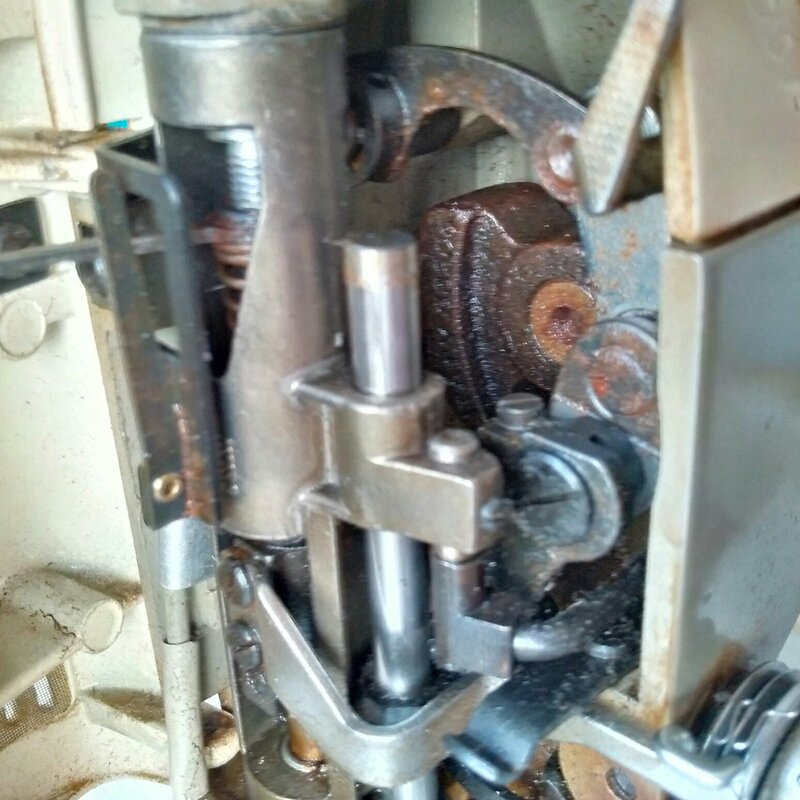 That double nut contraption bolts onto a sort of paperclip that hooks the reverse lever. Shortening the “paperclip” results in proportionally more reverse – just screw the nuts a bit further. But be careful – the “paperclip” is fragile! In particular on the threaded top end, mine is very rusty. But in this edition, I have to regulate the reverse once and it should work for all stitches. So I prepared several pattern cams for testing to make sure I get the same results as in the manual. This machine has some remarkable features that don’t look important at first sight – you only realise how clever they are once you start using it. My Supernova is a free arm model, so it comes with an extension table similar in design to many other machines. Usually such a table is a real pain though – you have to remove it to get to the bobbin. This is true for all those front-loading machines – it’s really awkward if you try to keep the table on, you can’t see a thing, stuff gets in the way, and fumbling with it by touch is difficult when you need to insert the bobbin case pushining forward. 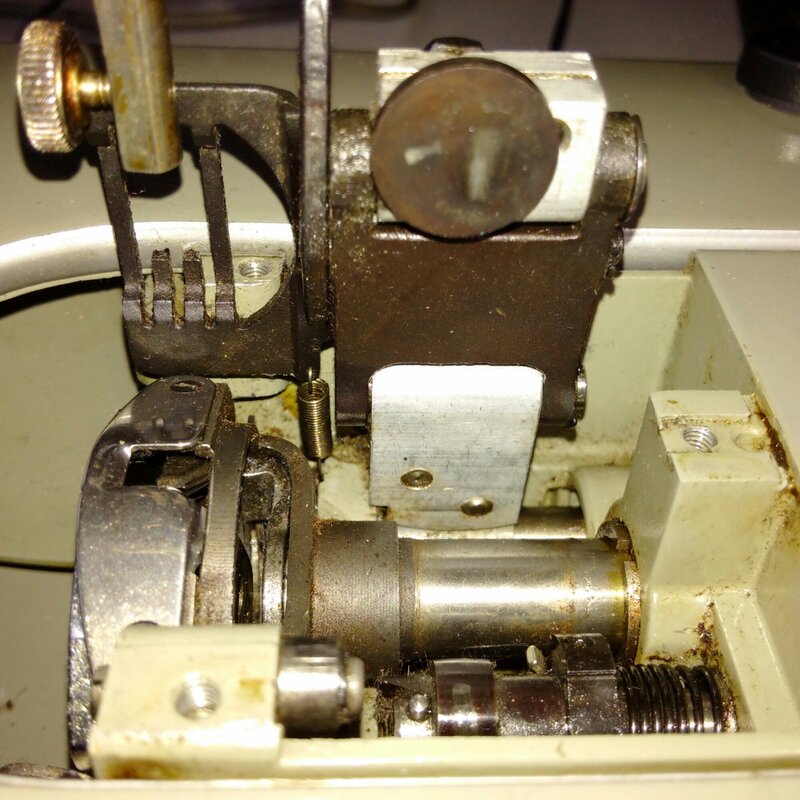 But the Supernova is side-loading, so access to the bobbin is unobstructed under the table, and you insert the bobbin case by pushing it to the right – so much more convenient! In fact, you can do everything – including replacing the needle plate and cleaning the feed dogs – without removing the table. She can drop her feed dogs, yet also comes with a cover plate for free hand embroidery. It clips onto the needle plate saving you the hassle of replacing it. The foot is raised in two stages: first, raise nearly to full height but don’t release the thread tension; second, raise fully and release the thread tension. You can feel the lever clicking into the first stage so you could stop there if you wanted. What is it good for? For turning corners in awkward places without having your thread pulled out, or for turning corners when sewing with a double needle, as you cannot pivot on two needles as you would do on one. And of course it’s got a free moving lever for zig-zag width that can be limited at either end independently. This is great for free hand zig-zag embroidery and monogramming. 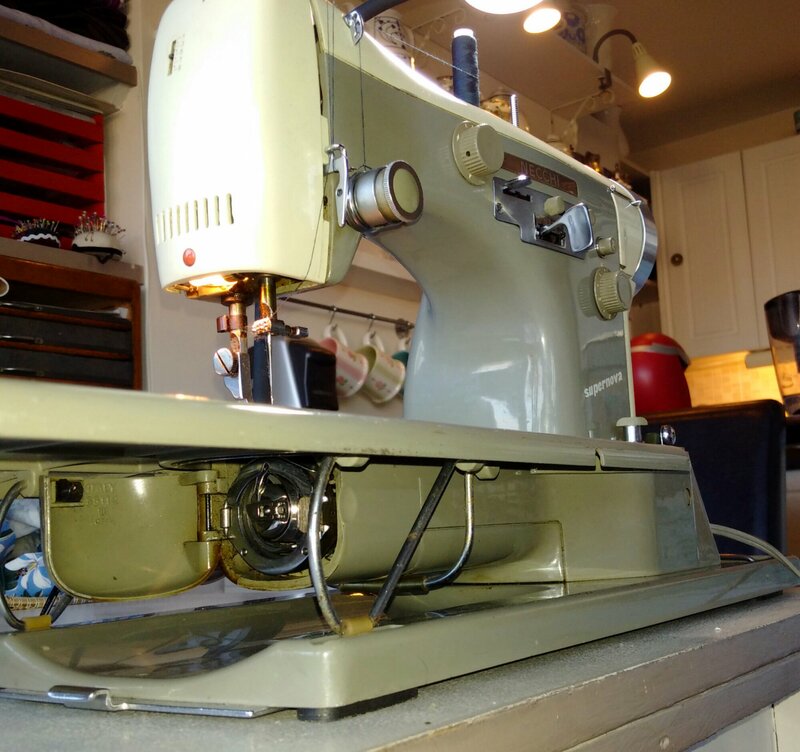 Oh my goodness I just adore your vintage sewing machine collection! It seems like there isn’t a vintage sewing machine issue or challenge that you find daunting – you just open it up and take it on! You honor these old machines who could have ended up in a landfill! Thank you, Tierney! 🙂 And you haven’t seen the best of Supernova yet – the embroidery. The project book suggests to embroider your leatherwear to match your dress – your gloves, your handbag, your shoes. SHOES?!! Just wanted to add: I am pretty confident I can fix most mechanical issues, assuming I don’t have to replace parts which are no longer available (although I solved one such problem with a timing belt). Mechanical things may be complex and baffle me for a bit, but ultimately all you need to understand how it works, is right there in front of you. There are no electronic boxes doing mysterious things – which is why I stay away from electronically controlled machines. And yes, I hate it when good things end up in a landfill! I really enjoyed reading this. I always learn so much from your posts. I hear you on the bobbin issue. I truly despise fishing for it under the table. I’d love an on off switch. I sewed an oversized canvas cover so that when I unplug the pedal and cord fit under it on the sewing table. Have fun stitching up samples! I can’t wait to see them. Thanks, Tony! 🙂 Yes I wonder why we don’t get on/off switches on sewing machines. 😐 I started on the samples. I’m trying to understand the logic of making up stitch patterns using available cams. There are 24 cams that can be combined in triples, where each position has a different function, so set 1-2-3 makes a different pattern from set 2-1-3, for example. Each cam also has four alignment options. That makes 884,736 possible stitch patterns. And then there are three continuous modifier knobs (scaling, stitch length, zig-zag width) and one discrete (needle position – left, centre, right). That makes too many designs to test! And most of them will be useless anyway, so I’m trying to come up with a more feasible approach. 🙂 Those modern computerised wonders that offer “a wide range of stitches” just make me laugh. 132 stitches? Ha! That is laughable! I’m sure you’ll sort it all out and figure out how to do your samples. This is the post I’ve been looking forward to and it didn’t disappoint. I take my hat off to you thinking of your own custom mods to the mechanicals! I’ve seen a couple of your comments on the Necchi Yahoo Group. 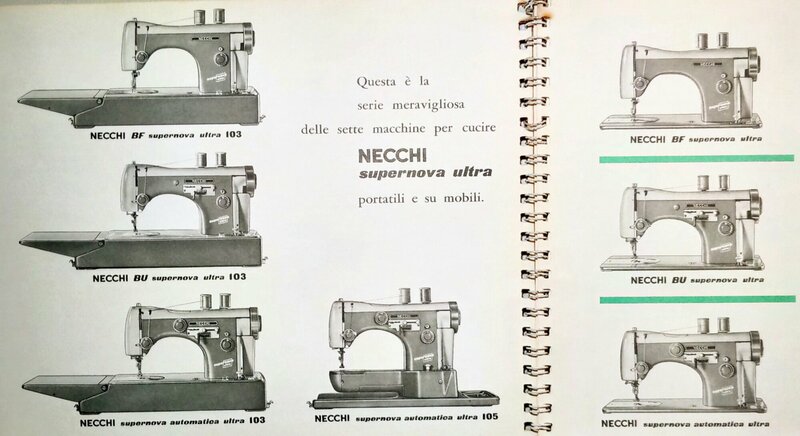 Have you got a copy of the Supernova Service Manual from the associated Necchi Sewing Circle file site ? I’m sure it’s better than the manual in you link, although I’m surprised how different the mechanicals are on yours from my Supernova Julia. Thanks, Dan! I have not joined the Circle yet. I don’t normally use service manuals because I like to figure things out for myself – I enjoy the challenge. 🙂 But in this case I didn’t want to disassemble too much because a lot of parts got rust on them making them fragile. I just wanted to see an “exploding diagram” of the zig-zag assembly, and the older Nova/Mira service manual was close enough – very close on that point, actually. So I didn’t look any further. I’ve heard that Julia was significantly different from the original Supernova. After all, there have been two versions in between: Ultra and Ultra II. I’ve also read in the files on the Necchi group that Julia takes different cams than its predecessors. Is that true? I seem to remember seeing the same kind of boxes with Julias as with the older Supernovas, so not sure what’s going on. I would come out in a cold sweat taking apart something as complicated as one of these Necchi’s without some instructions! I’m pretty sure the adjustment of the zig zag zero position is covered in the Supernova service manual by the way….. Looking at the photo’s of your machine I think the rust is all purely cosmetic. I’d be putting rust remover everywhere if it were mine….. 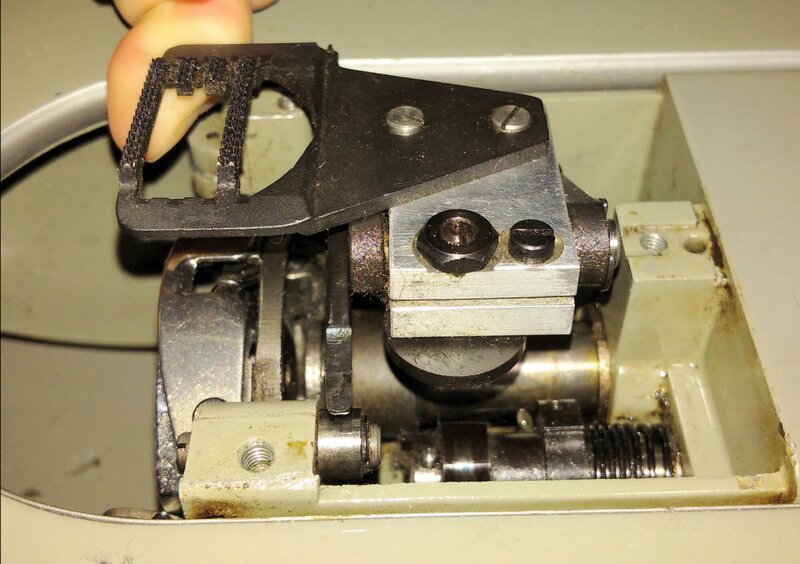 Various types of cams are shown in the photos/albums part of the NecchiSewingmachineclub Yahoo group. You have to scroll around a lot. I may be wrong but I think the Supernova cams are interchangeable regardless of model. Other Necchi “series” models certainly have different cam designs. My understanding is the mechanics of the Julia are very similar to the other Supernova’s apart from the automatic mechanism, which is more complicated on the Julia. I haven’t been brave enough to disassemble or remove the automatic mechanism on mine even with the manual! The free-arm models do seem to be bit different though – in the way the feed works for one thing. There’s not much service documentation I’ve found on them..
Dan, if the zig-zag adjustment is covered in the right service manual, then this is exactly the reason why I do NOT want to consult it. I don’t repair machines for a living where the result is the most important thing. I don’t even repair them for other people, I do it exclusively because I enjoy solving mechanical puzzles. Of course, the puzzle is only solved when the machine is working perfectly. 🙂 So I am not afraid to spoil or break things, although I do take proper precautions – I don’t want to ruin things by brute force either. Regarding rust, yes it does look just surface rust here. 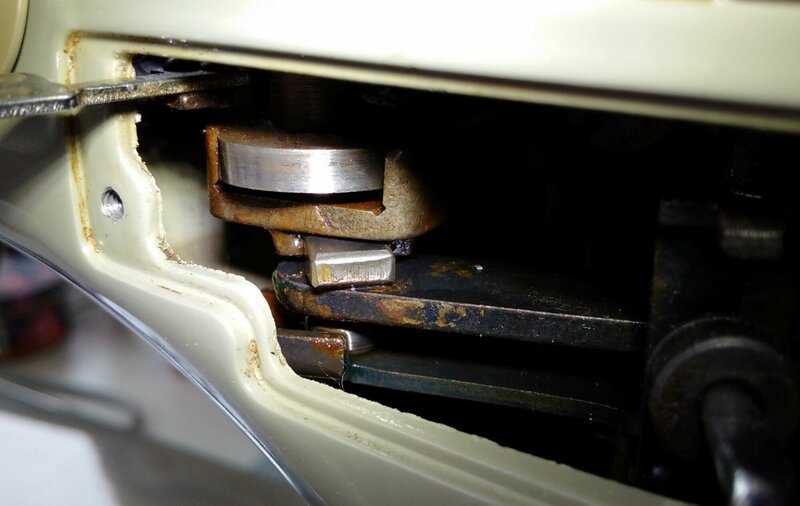 But those parts are thin, so if too much of the surface has corroded away, and in particular if that corroded layer has been removed, the part may just snap – too thin. I know you’ll tell me that the sitting rust is not helping to reinforce a thin part, but actually it does – it provides cushioning. I have obtained experimental evidence to support this quite a few times, and my uncle the car mechanic says the same thing. 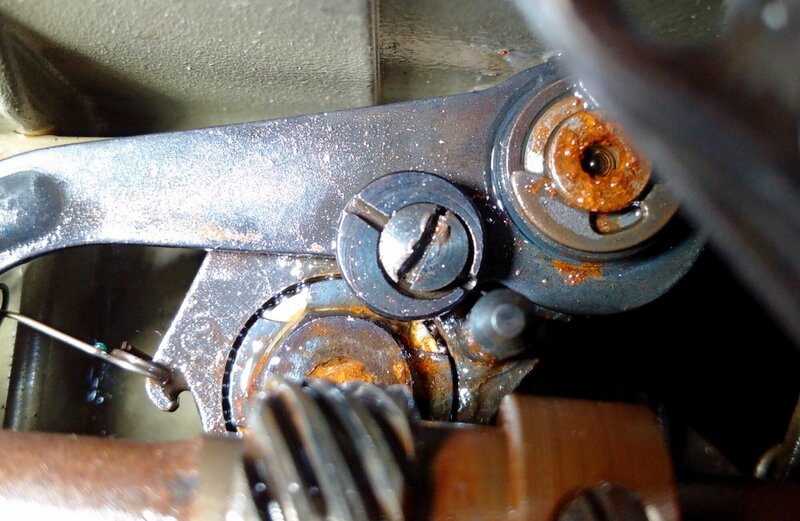 🙂 So I only remove LOOSE rust particles if they clog things up, except of course in cases where the whole thing rusted together – there rust works like glue and needs removing. I know my approach is not “proper textbook” but it works for me, and that’s all I need to worry about. This is the joy of tinkering, not professional repair. 🙂 And equally, I’m not afraid to modify my machines either. I still haven’t finished my conversion of Vesta transverse shuttle to triple needles because life got in the way and Vesta has to wait, but I already have a Singer 48K cylindrical transverse shuttle queuing to undergo the same transformation. The Vesta was always meant as a prototype, but the Singer will be the real deal for me to use. Mind you, Vesta is coming on beautifully too, so will be a perfectly working machine for someone else to use. Yes, free arm machines always have something different in the bottom part because of space constraints. Sometimes it requires changes to the upper mechanism too. I agree rust remover on thin, stressed parts like springs is a bad idea – keeping the parts coated in oil would then be my choice. We obviously have different approaches to repairs and adjustments – my technique is to try and get as much information in advance of starting as I can, to get to the solution quickly and with the minimum of cursing and swearing when I can’t work out what the heck is going on. You seem to enjoy that bit! Reading a manual before attempting a repair is like looking up the crossword answers before tackling the puzzle – where is the fun in that? 🙂 But your method is of course much wiser if it’s the result you’re after rather than the process of getting to it. Thanks so very much for visiting my blog! Like you, I like tinkering with these old machines and saving them from the landfill. You have a wealth of information here and I am glad I found you! I have a suggestion for your machines that lack the on and off switch.I put things like that on a heavy duty power cord with an outlet box with a switch. Then I can use that switch to control the machine. I usually put the switch on the floor close enough to reach with my foot and I have “one toe” control…Best wishes on your excellent hobby! Thanks, Toni! Yes, I have them all plugged into an individually switched plug bank (plug list). There’s a switch next to each socket. 🙂 But I only have to do it because they don’t have on/off switches on them! I have an embroidery example book if you want to see it, as in cloth with pretty embroidery in a booklet. Thank you, Flavia, but I think I have the same booklet – they call it “The Project Book”. I haven’t tried any of the more involved embroideries from it yet though. Please, which three cams, in what order, make up the overcasting stack? Thanks so much for sharing your work. I really appreciate it. Hi Jane, the Supernova doesn’t do utility stitches, I’m afraid. 😦 Although a few utility cams were made later, they are fixed cam stacks – stitched zig-zag and blind stitch of sorts – and they are not very good. The only overcasting that the Supernova can do, is plain zig-zag – without any cams. Yes, I understand that; what I am asking about are those later utility cams. What numbers are they? There isn’t one for the overcasting stitch, sorry. Or at least I’ve never seen one. I’ve only seen stitched zig-zag and blind stitch – both without the reverse motion. The Supernova cannot make a looped overcasting stitch like other machines do because the Supernova has a very different way of making fancy stitches. 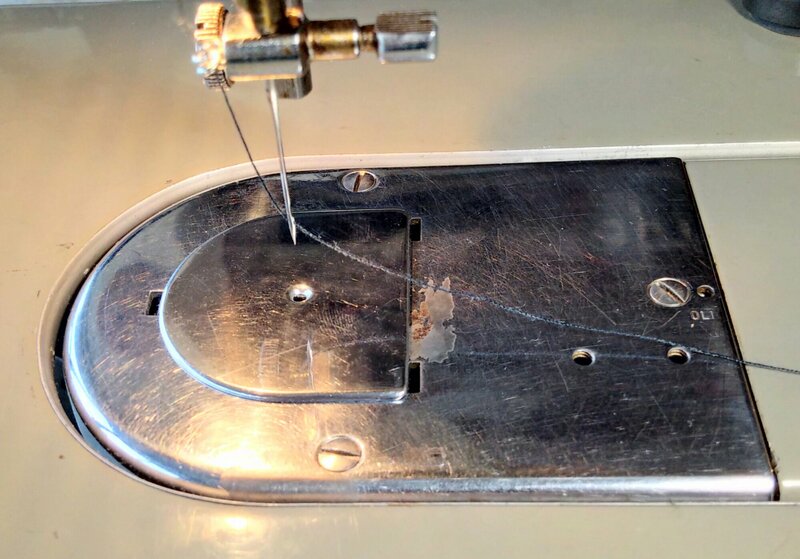 It does not synchronise needle and feed motion on a stitch-by-stitch basis, but rather it superimposes a general pattern of feed motion onto a general pattern of needle motion. None of the cams are stitch-by-stitch, which is why those later utility cams are so inferior. According to my manual, the overlock stitch is just to zig-zag on raw edges. It’s more than simple zigzag; it also includes forward/reverse to loop the stitches over the edge, used with a special foot to extend the loops. 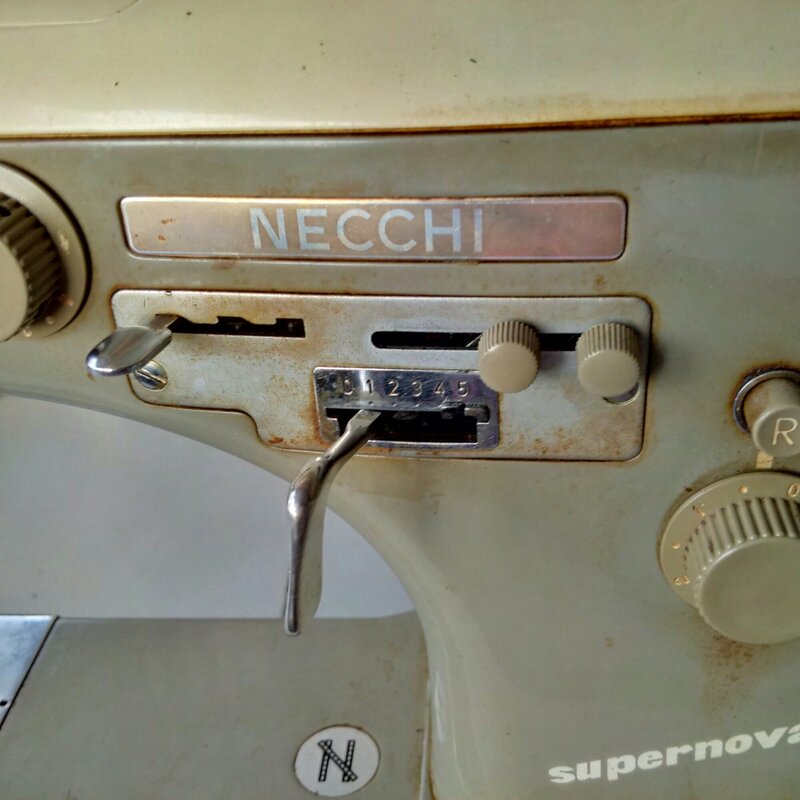 I really enjoyed your article on the Necchi Supernova; this sewing machine has been in my family for over 40 years. My mother loved to sew and was very good at it. I remember in the 80’she made us ‘bermuda shorts’ as kids when this style first arrived. I also remember my mother and I tried to make a pair of sweat pants and jump suit for the family dog during the cold winter, but didn’t account for how skinny our dog was and the pants simply fell off! I’ve since inherited this machine and have kept it in my garage wrapped up for many years now. The time has come for me to make a hard decision to let this go. 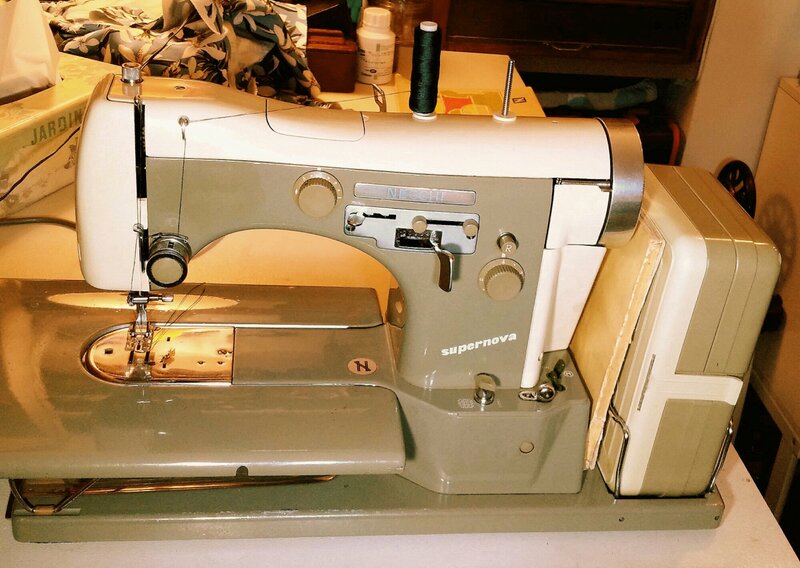 Can you suggest some options I may have to find a new home/owner for my mother’s vintage sewing machine? Hello Roland, the options really depend on the country you are in, as well as on your preferences. Here in the UK I use eBay, but other people prefer local classified ads, for example. Sorry I cannot be more specific. Hello Elena, I have been Googling and can’t find the answer – do you know how many cams the Necchi Supernova Ultra Mark 2 is supposed to come with? I have seen an ad for one. It’s such a nice PINK with a circular needle plate I am very interested in it! LOL Is there anything I should watch out for with this machine if I do get one someday? Hello Linda, the cams come in their own accessories box, so just make sure that every slot is filled. I don’t know how many that model has. 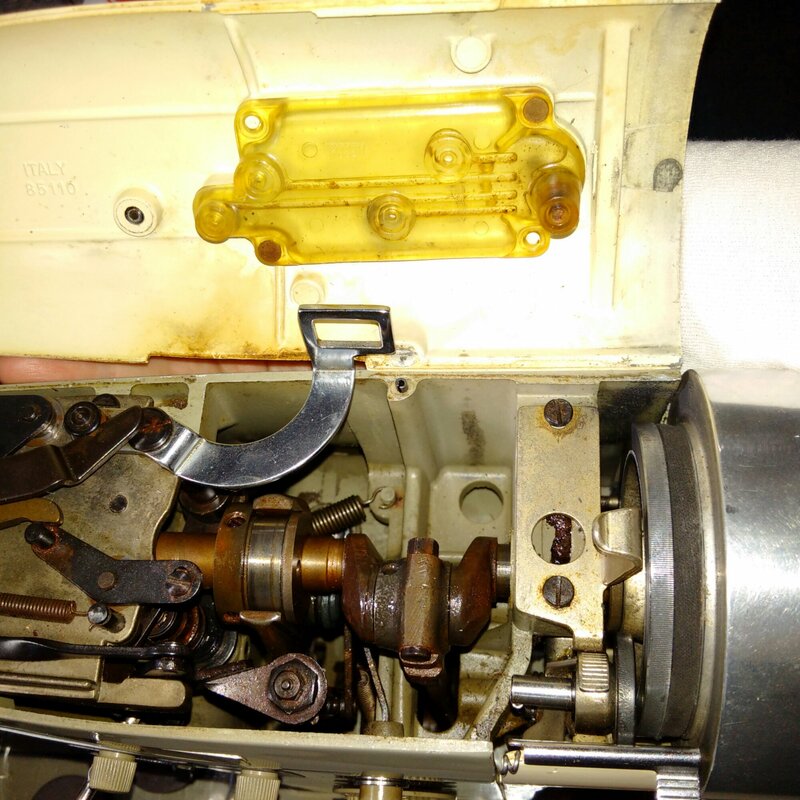 Beware that it has plastic gears in most places, so make sure they are in reasonable condition as spares are not to be found. This is one of the reasons I stick to the original model – no plastic gears. Thanks for the info! The fellow was advertising it as an “all metal” machine! Well, it could be either way. I’ve never had one myself, so my information is second-hand and could be wrong. But I have also seen all too many machines on eBay advertised as “all metal” but in fact having plastic gears. It’s all metal except for a few bits! 😉 Perhaps you could ask him for some photos of the mechanism to get an idea. Good idea! Then I’ll see what the real deal is! Thank you!